Russia's chief prosecutor has sent a new request to the UK for the London-based Russian tycoon Boris Berezovsky to be extradited. Yuri Chaika's request followed Mr Berezovsky's claim on Friday that he was working to overthrow Russian President Vladimir Putin. Russia wants the UK government to strip Mr Berezovsky of his refugee status. Russian prosecutors have previously charged him with fraud. He was granted political asylum in the UK in 2003. Russia's latest extradition request was triggered by Mr Berezovsky's interview with the Guardian newspaper on Friday, in which he said he was plotting a "revolution" to overthrow President Putin. The tycoon later clarified his words, stating that he was advocating "bloodless change" - not violence. On Friday the UK Foreign Secretary, Margaret Beckett, said she was aware of Mr Berezovsky's comments to the Guardian, "appearing to call for the overthrow of the current Russian government by force". "I deplore such sentiments. We expect everyone living or working in, or visiting the UK, whatever their status, to observe our laws and regulations. The Home Office will now seek to collate full information on the alleged comments so that a review and full assessment can be made," she said. Writing in the Guardian on Monday, Mr Putin's spokesman Dmitry Peskov said Mr Berezovsky's motives had been laid bare. "We now expect the British authorities to rethink their decision to harbour a fugitive billionaire," Mr Peskov wrote. Mr Peskov quoted a Russian academic, Andrei Piontkovsky, who called Mr Berezovsky "the embodiment of robber capitalism". Mr Peskov said Russia "no longer tolerates the unfettered personal acquisition of state assets". 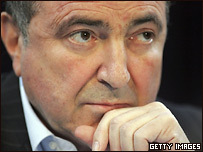 Mr Berezovsky has a fortune estimated at £800m ($1.4bn). Previously an ally of former President Boris Yeltsin, he has already fought off Russian extradition requests on fraud charges which he said were politically motivated. He was one of the first targets of President Putin's crackdown on the Russian oligarchs - well-connected entrepreneurs who made fortunes during privatisation - and went into self-imposed exile at the end of 2000.